Join us as an Arts and Crafts Artisan for the 41st Annual Michaywe Arts & Crafts Fair on Friday and Saturday, August 9 & 10, 2019, in northern Michigan. A&C Visitor Flyer 2019. As a peaceful, four-season recreational and residential community, Michaywe is a stunning setting for the annual Arts & Crafts Fair. We are 8 miles south of the Gaylord, Michigan’s Alpine Village, and just east of I-75 in the Heart of Northern Michigan. 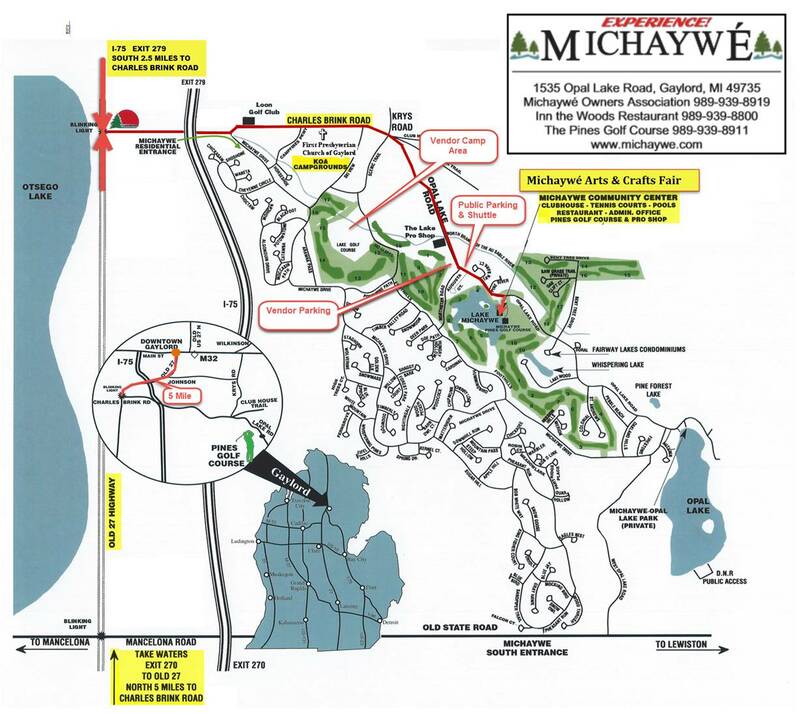 The Michaywe Arts and Crafts Fair is easily accessible from across northern Michigan including Traverse City, Charlevoix, Mackinaw City, Petoskey, Harbor Springs, Alpena, Indian River, and West Branch. Michaywe’s clubhouse and its wooded, park-like setting serve as the backdrop for the fair, which can comfortably accommodate more than 100 exhibitors.